when every year there are miracles like white dogwood. The day had been a bit stressful as I hurried to get my grand-son to his dental appointment on time. Our preplanned itinerary had been changed by circumstances out of our control and this had caused me to pick him up late. In order to save time, I decided to take an unfamiliar “shortcut” that might possibly assure us a timely arrival. Neither grand-son nor I had ever visited this dental office before so we were traveling in unknown areas with bad weather, heavy traffic and stress as our companions. Not a very delightful trip to say the least! However, as tense as it all was, we did make it with two minutes to spare, and one of those minutes I used to admire a beautiful Dogwood Tree that stood just outside the dental office. As my grand-son hurried up the steps to go inside to check in for his appointment, I chose to stop for a moment and enjoy the beauty God had placed in my path. That moment in time was a blessing because it took my mind off the cares of the day and focused it on the beauty of nature. As I snapped a picture of the white blooms I realized that this White Dogwood tree had changed my stressed day into a blessed day. I have to agree with Anne Morrow Lindbergh, the Dogwood Tree is truly one of God’s miracles and I am glad I had the chance in the middle of a busy, stressful day to experience it’s beauty and be blessed. 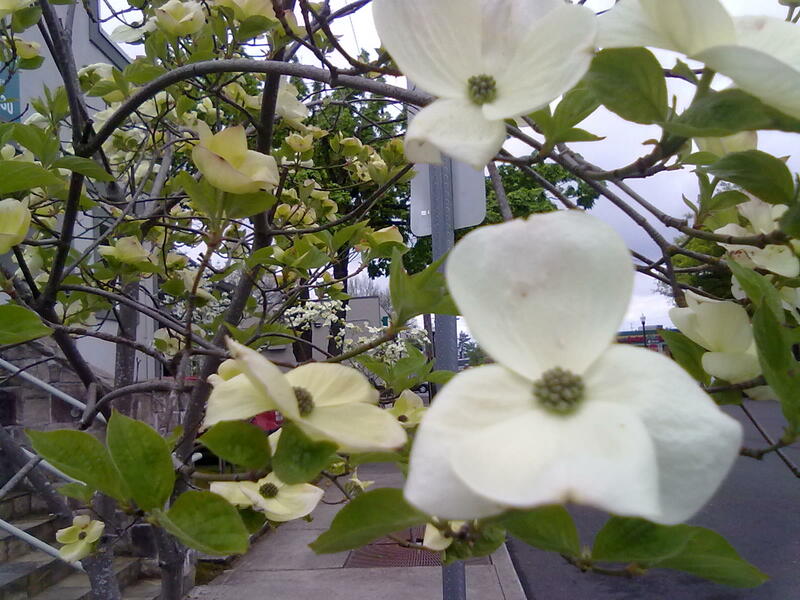 The White Dogwood is called “the SuperStar of Flowering Trees” because of it’s varied beauty. It not only blossoms in May with with beautiful white flowers, it also makes a bright show of red in the fall with it’s colorful leaves and again in the winter with bright red berries that cause a splash of color against it’s silver bark. Although the berries are poisonous to humans, they are not to birds and squirrels who enjoy eating them during the cold months of winter. The Dogwood bark is said to have medicinal qualities and it’s wood which is very hard and strong is often used to make walking canes, golf clubs, or longbows. Since Dogwoods are small trees they are perfect decorative addition to a small garden, patio or deck area.